Sometime around noon on Saturday, an email sent by the guy who runs this website landed in my inbox. It was the first day of March, and because that same person is also a noted leader in the perverse enjoyment of terrible basketball, February’s end meant one thing. “It’s officially the season!!!!! !” the email began. He didn’t mean spring. With the NBA reaching its homestretch, it’s time for the tanking to begin in earnest. And that means A Fate Worse Than Death has returned. For those unfamiliar, AFWTD: Basketball Edition is the creation of Grantland’s own Rafe Bartholomew, inspired by Homer’s twisted punishment upon being sent to hell on The Simpsons. Homer was forced to eat all the doughnuts in the world, the goal being that he’d come to loathe something he so loved. Watching horrible — and at this time of year, occasionally insulting — basketball is a similar sentence for those of us who love the NBA. The aim — one born of self-preservation, really — is to find the morsel of basketball goodness still there among the awful. Last night in Milwaukee, that wasn’t going to be easy. Because I was already in town for reasons unrelated to watching Nate Wolters start an NBA game, it seemed worth catching the game in person. I wasn’t surprised when I got to the Bradley Center and saw it was mostly empty. The lower bowl had its share of folks by tipoff, but the upper deck was void of people for the entire night. It’s hard to blame them. This is the sort of Milwaukee winter that sends people to travel and real estate websites in droves. The cold has not only been assaulting, but unrelenting. Downtown Milwaukee has been a frozen hellscape for months, and at a balmy 9 degrees before tipoff last night, it’s hard to hold it against anyone who chose a couch and a fire over an 11-47 basketball team. The crowd of barely more than 10,000 was the worst of the season. It was never going to be great in Milwaukee this year, but it wasn’t supposed to go like this, either. The Bucks were the model for how not to spend free-agent dollars, tying up long-term money in players like Zaza Pachulia and O.J. Mayo, but it made sense through the lens of an aging owner bent on making the playoffs. Milwaukee would contend for the no. 8 seed, get bounced by Indiana or Miami, and six months later, it would all start over again. Then Larry Sanders got in a bar fight, Mayo was a disaster, and the Bucks started hemorrhaging wins. All that is enough to leave attendance figures a little shaky. Still, as there are at most NBA games, there were people willing to do anything to earn seats just a little bit closer. In some arenas that might mean a basketball-themed activity or a random prize winner, but the Bradley Center’s method of seat improvement is decidedly more Midwest. A couple of minutes before tipoff, four gentlemen at a courtside table were given bottles full of “burger sauce,” a concoction of half-ketchup, half-mayo with a smattering of relish. The goal: Drink as much as you can in 30 seconds. As a Bucks fan resembling Grantland’s own Chris Ryan — if Chris survived entirely on protein powder and brats — housed the entire bottle, the hype woman officiating the contest looked on gleefully. “I’m hoping for a little gag reflex,” she said. She could have been talking about any of us, really. Across the court last night were the Utah Jazz, who were at least up-front about their intentions before the season began. In a season that saw Paul Millsap make the All-Star team, and on a night when Al Jefferson had 38 and 19 against the Heat, Andris Biedrins and his $9 million expiring contract looked to be having a great time in the layup line before the tip. The Jazz were fresh off a 94-91 loss in Indiana the day before. Asking a team to play a back-to-back after seeing the Pacers is pretty much like asking an NFL team to play the Sunday- and Monday-night games, and it showed. Utah had trouble putting the ball in the basket from just about everywhere last night, but especially from 3. Shots clanked off the rim for most of the first quarter, and Utah’s effort on the other end wasn’t much better. Tyrone Corbin did call timeout after Wolters managed to go coast-to-coast after an Ersan Ilyasova block to make it 15-8, but I’m not sure even his heart was really in it. With a couple of minutes left in the first quarter, an official timeout turned into an extended one when the game paused to honor a distinguished guest. Everyone walking into the Bradley Center yesterday was handed a faux-autographed photo of one Kareem Abdul-Jabbar, and I wondered if that meant there was a chance — albeit slim — that Kareem would be in the building that night. Sure enough, unfolding himself off a courtside seat during the timeout was the NBA’s all-time leading scorer. 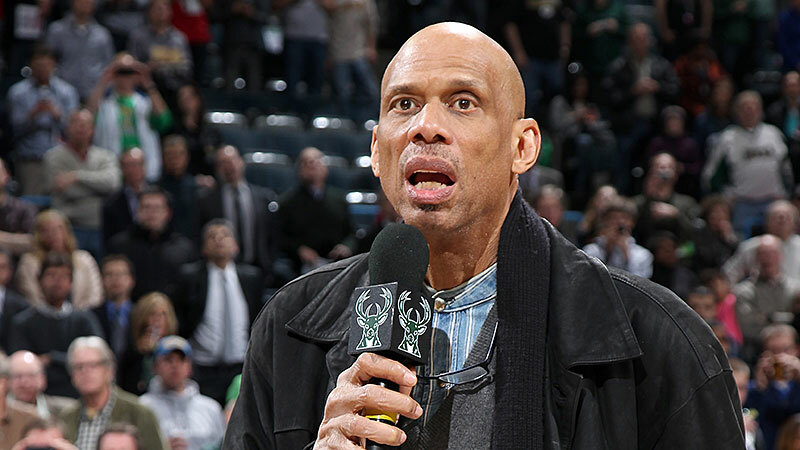 Kareem got the night’s biggest ovation, but the second-loudest went to none other than Giannis — who, seriously, is only referred to by his first name at all times by the PA announcer. During a season in which there hasn’t been much to cling to, everything Giannis has been a saving grace for Bucks fans. Everyone knows about the length of his arms, but what’s striking about seeing him up close is the length of his legs. As he waited to inbound the ball at one point last night, it looked like his hip was just about in line with the ref’s armpit. It doesn’t even look real. The two most exciting plays of the night unsurprisingly involved Giannis Antetokounmpo running the floor. Early in the second quarter, Giannis sent back an Alec Burks layup, got the ball back on the break, and found Ramon Sessions with a behind-the-back pass for an easy layin. Then, as the game was winding down, it was Giannis again running the break, this time working a little give-and-go for an and-1 lob with O.J. Mayo. Among all the cold and heartbreak in Milwaukee this year, there is undoubtedly something to look forward to. Last night, though, even the flashes of Future Giannis weren’t enough to steal the show. I don’t know if Ilyasova has a sense for when we’re doing a Fate Worse Than Death, but for the second time in three seasons, he put together one of the best games of his career on a night when we desperately needed something. He was everywhere last night, from the opening tip. When Ilyasova buried a shot from the left corner with his foot on the 3-point line late in the first quarter, it was almost as if he were trying to make it hard on himself. He was 7-for-7 at halftime, and that was just the start. I don’t remember the ball hitting the rim on a single jump shot the entire game, and when he beat the shot clock with a step-back jumper while falling out of bounds, I really didn’t think he’d miss. He finally did, but just once. 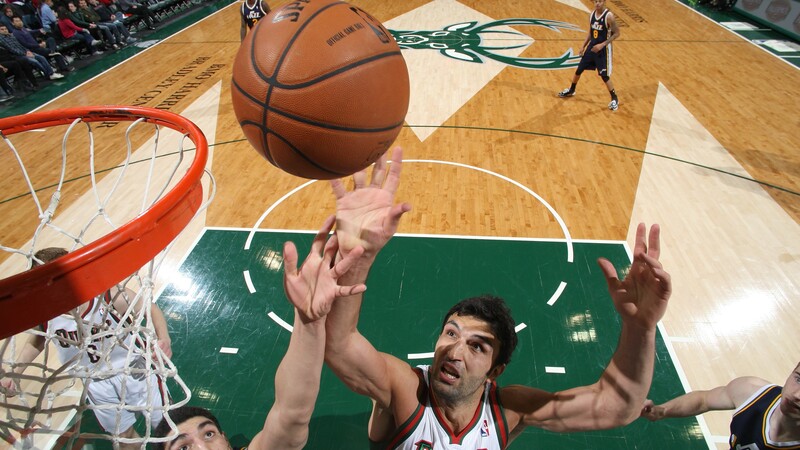 The Bucks scored 40 in the third quarter, with Ilyasova doing most of the damage. At a certain point, when the ball would go elsewhere, I found myself yelling at his teammates to get it back to him. It was that kind of night, when for whatever reason, it was all working. With Milwaukee up 28 at the end of the third quarter, Ilyasova draped two towels over his shoulders and went to the bench. His night was done. He had 31 points on 13-of-14 shooting. It was two points shy of his career high. I realized early in the fourth quarter that I hadn’t been the only one to look up where the game ranked among Ilyasova’s best. A section over, a pierced and tattooed Bucks fan spent most of the final period pleading with Larry Drew to let Ilyasova go for a new career high. I felt the same way.